First Data acquired Western Union in 1995 after completing a $7 billion merger with First Financial Management Corporation. But First Data had tried to acquire Western Union before, in bankruptcy court, a year earlier. This bloomberg.com article on the Jan. 26 First Data announcement provides some background on Western Union and its emergence from the edge of bankruptcy in 1994 when First Financial Management Corporation bought them in a $1.19 billion deal. Interestingly enough, this isn’t the first time Western Union has discontinued telegrams in some way. But it would seem this discontinuation represents the passing of an American era (despite the fact that it in fact ended years ago) in a more permanent way than it has in the past. Telegrams have always held a special place in American folklore. Western Union telegrams will be forever associated with the tragic notifications of the 20th century’s greatest conflicts. The discontinuation of telegrams on Jan. 27 included not only telegrams but mailgrams and singing telegrams as well. By 1980 money transfer revenue exceeded telegram revenue for the first time and the company never looked back. As for Western Union’s statement on discontinuing telegram service, I heard back from Colin Wheeler, Vice President of Corporate Communications at First Data Corporation, which, of course, owns Western Union. He gave me a prepared statement which is below. “Because we are operating in an increasingly competitive marketplace, Western Union is constantly reviewing operations to maximize service value, focus on our core competencies and directly address the ever-changing needs of the marketplace. Western Union has decided to discontinue the Western Union Communications business which includes Commercial Messaging and Telegram services. So, Western Union telegrams have been a mainstay of American life, not only through our most tragic times but also through events of historical significance. Telegrams from throughout history still exist. From historical figures, as chronicles to historic events or just as personal communication between people whose place in history had yet to be determined when they sent their message. 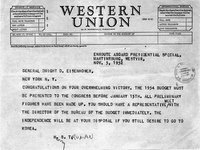 2) 1952 telegram from Harry S. Truman to Dwight D. Eisenhower congratulating him on his election day victory. 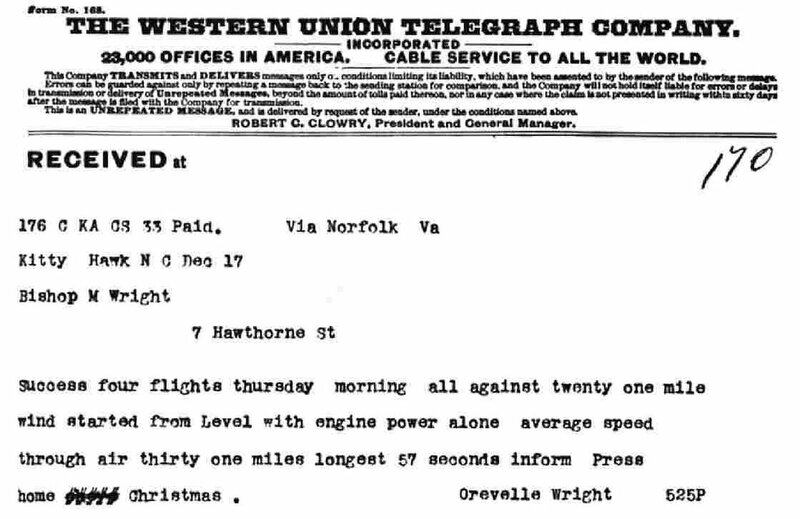 3) Telegram from Orville Wright to his father regarding the Wright Brothers first flight. 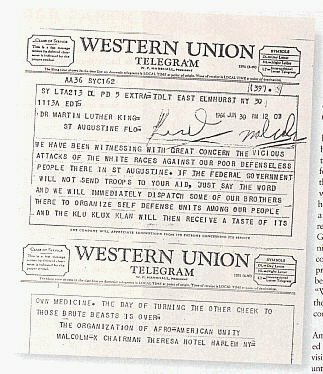 4) 1964 Telegram from Malcolm X to Martin Luther King Jr. 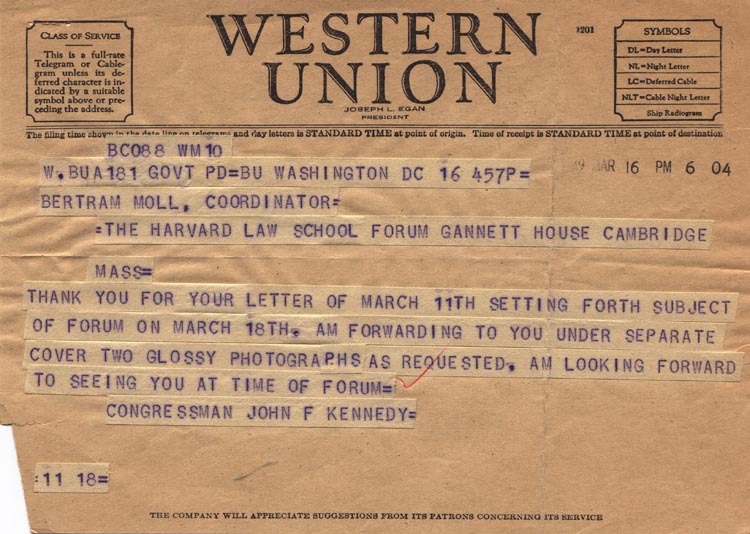 Concerned about continuing civil rights violations and violence against African-Americans in the U.S.
Telegrams have played more than just an arbitrary role in American history. They have not always been relegated to the background noise of American culture. 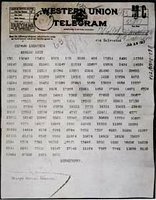 Before the United States entered World War I there was the infamous “Zimmermann Telegram” incident. 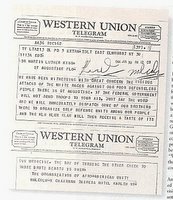 For those of you who don’t know or didn’t click the link, the Zimmermann Telegram called for a German-Mexican alliance if the United States entered the war against Germany after the Germans began “unrestricted submarine warfare.” As part of the deal, if the alliance was victorious in battle, Germany promised to help Mexico regain “the lost territory in Texas, New Mexico and Arizona.” This telegram was intercepted by British intelligence and reported by newspapers on March 1, 1917. The Zimmerman Telegram added to mounting pressure for the U.S. to enter the war but President Woodrow Wilson held out until April 2, 1917. The proposal contained in the telegram German Foreign Minister Arthur Zimmermann sent to the German Ambassador in Mexico may seem far fetched but it’s not, not really. Mexico still harbored some pretty deep seated resentment regarding the Mexican War of the mid-1840s, they lost face, territory and pride during that conflict with the United States. A last bit of old life is gone now. The days of paper-based communications are coming rapidly to an end. Now, computers take over and the idea of holding important information in your hand slips away slowly. Today, to intercept a Zimmermann Telegram would require electronic surveillance and security experts. Old-fashioned code breaking is so much more complex. And there is something to be said for being able to look at a solid object (like a slip of paper) and read the words spoken during the past. Telegrams are the IMs of yesteryear. For nostalgias sake, below are some of the headers from Western Union telegrams throughout the years. Those of you who know me, you might know that I enjoy old things (architecture, technology, objects, etc. ), this had more than a passing influence on this post. Non-telegram photos: Photo 1: A woman cries over a war lost beau. 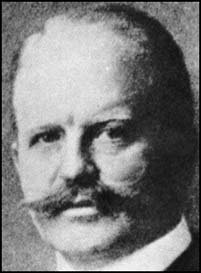 Photo 2: WWI-era German Foreign Minister Arthur Zimmermann. 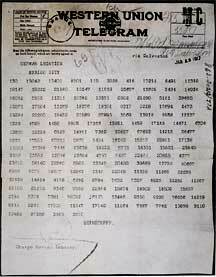 Photo 3: The infamous, coded Zimmerman Telegram that helped draw the U.S. into WWI. As someone in the performing arts, I find this very disturbing. I have a good friend opening in a show at the Goodman in Chicago, he’s playing the lead and although he’s experience success with his music, this is a very big deal. So, I thought I’d send him a cool vintage looking Western Union telegram which not only have a reputation for bringing bad news, but until recently I guess, they were practically expected for actors to receive them on opening nights. It’s a loss. What do I, send a card? Good Luck is a bad thing to say for superstitious actors – Break a Leg is the only acceptable thing to say on that special night. And I’ve never seen that section in a card store, have you?